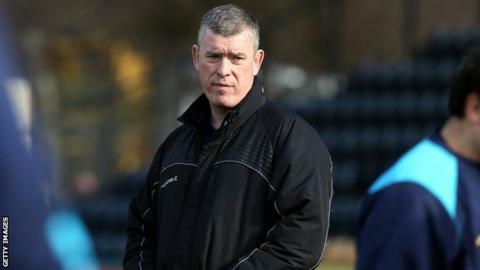 Worcester boss Dean Ryan predicts that his relegation-threatened side are going to have to win two of their final three games to stay in the Premiership. The Warriors are seven points behind 11th-placed Newcastle going into Saturday's trip to high-fliers Bath. "We all know the maths," Ryan told BBC Sport. "But it looks like we might have to get two wins. "If we get to the final weekend and we haven't won, we know that's it. We know the maths will be done by then." Following the Bath game, Worcester then go to leaders Saracens before finishing with a home game against Ryan's old club Gloucester on 10 May - arguably the most winnable of their remaining matches. But, even if they were to score four tries and win against the Cherry and Whites, for a bonus-point victory, and manage narrow bonus-point defeats at Bath and Saracens, that would only earn them seven points. And, with Newcastle having already earned three victories to Worcester's one this season - that they would be the first determining factor of which team finish higher in the table, should the points tallies be the same. "It becomes eight points," said Ryan. "We've got to be on equal wins with Newcastle. "We know we've got to do something impressive. We're playing one of best sides in the country and, in two weeks' time, we're playing the best side. "We've got to get something out of those games and that makes it pretty difficult for us. "We've got some upward momentum. But are we capable of pulling one off? We're not going to hide. We're going to give it a crack." Worcester's whole escape plan relies on Newcastle not getting another point from their final three games - at home to Saracens, away to Wasps and then at home to Exeter on the final day. But Ryan is focused only on what his own side are capable of doing. "If Newcastle go and win a game, then good luck to them," added Ryan. "But they have not looked like that for some time now, whereas we are starting to look dangerous, like we could win matches. "With three games left, we feel like a side on the up. "Whatever Newcastle do doesn't change that. We have to get a big result. The bottom line is that we've got to play well and we've got to defend well."